The City of Laval has been making a lot of headlines these past few months and not for good reasons. Former Mayor Gilles Vaillancourt and the corruption scandal have given Quebec’s second largest city a bad name. Recently, the government placed Laval under trusteeship. Well, I have something nice to say. A mile down the street from the Boulevard Souvenir City Hall is a makeshift tent village which serves as the home of the internationally acclaimed Cavalia’s Odysseo, the magnicent horse and acrobatics show which simply took my breath away from the moment the program began. Entering this complex feels a bit surreal. For some reason Laval has kept this huge piece of land where Souvenir meets Highway 15 vacant for years. And it makes the ideal locale to stage this spectacle. I was treated to a behind the scenes tour of the 38-metre tall White Top and the stables by Director Wayne Fowkes and top-notch publicist Annie Leclerc. This was a week before I actually saw the show and let me say I still have goose bumps. There is ample parking and Laval has done a superb job with the signage around town, making sure you can find the precise entrance. It is $10 a car. A scene from the extraordinary grand finale. It is very hard to believe that this is not a permanent structure as it is so well assembled. I took in an afternoon show, where a capacity crowd of 2,000 people waited impatiently for the program to begin. There were folks of all ages and even the little babies sitting near me were mesmerized by the extraordinary scenery, gorgeous horses and beyond talented acrobats. The program begins with a bilingual quiz, with questions appearing across the curtains such as how many horses are in the show. They gave you three choices and then ask for hands to go up for each answer. Loud applause can be heard each time an answer is posted. It is the perfect warm up before more than half a dozen horses trot on to the sandy stage. This is a two hour show, with a 30 minute intermission and it truly goes by fast. 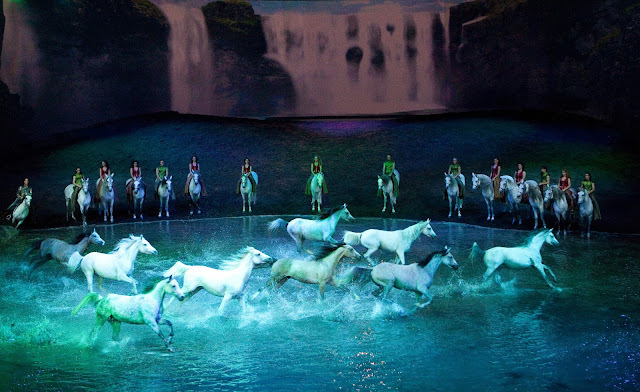 I would certainly say that there is probably no program combining the grace of these 67 horses and crew of acrobats as good anywhere in the world. While it tours the globe, this is a made in Quebec operation so we are fortunate to have it here every couple of years. This run was supposed to end its run on June 15, but it has been held over until July 21. The advertising campaign for Odysseo is extensive. You cannot drive anywhere in this city without seeing a giant billboard, not to mention newspaper, television and radio ads. I was blown away when a real carousel dropped from the ceiling of the tent and a 302,000-litre lake appeared for the grand finale. There are three IMAX screens. I last saw Cavalia about four years ago, when it the makeshift city surfaced on a big chunk of vacant land off Highway 40 near Lucerne in TMR. That land has since been built upon. Ticket prices range between $45 and $139 plus tax. For a memorable evening, the Rendez-Vous package offers the best seats in the house, exquisite buffet-dinning before the show, open bar, deserts during intermission, and an exclusive visit of the stable after the show. This unique VIP experience takes place in a luxurious tent alongside the White Big Top. The VIP package prices range from $165 to $246. Tickets for Cavalia’s Odysseo are available online at www.cavalia.net, on the phone by calling 1-866-999-8111, or in person at the box office on the show site. 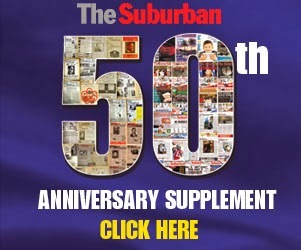 See The Suburban on June 12, 2013 for my full story. Here is a preview of the show.